Swedish journalist Kim Wall remains missing after an inventor's sunken submarine was refloated, towed to Copenhagen harbor, and found to be empty. Police investigators say it seems the vessel was deliberately scuttled. 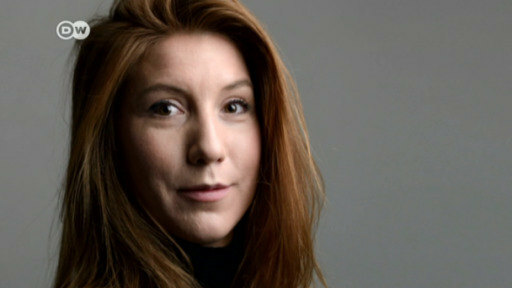 Danish police have intensified their search for a missing Swedish journalist who was last seen boarding a homemade submarine that police say was deliberately sunk several hours after she boarded. Journalist Kim Wall disappeared Thursday evening after boarding the Nautilus sub, a 60-foot (18-meter) submersible vessel. The 30-year-old reporter was writing a feature story about the submarine's Danish owner and inventor, Peter Madsen. Police began searching for the vessel early Friday after Wall's boyfriend reported her missing. Some hours later the submarine was located in Koge Bay, about 30 miles (50 km) south of the Danish capital, Copenhagen. Copenhagen homicide chief Jens Moller Jensen told a news conference no persons "dead or alive" were found when technicians in protective suits entered the 18-meter (59-foot) submarine on Sunday. It seemed that the vessel, named UC3 Nautilus, had been deliberately scuttled, Moller said, referring to its sinking around midday Friday in the Bay of Koge, 50 kilometers (30 miles) south of Denmark's capital. "It appears as though it was a deliberate action that caused the sub to sink," Moller said. "We're still hoping that we'll find Kim Wall alive, but we are preparing ourselves for the fact that she may not be." The inventor, 46-year-old Peter Madsen, has been accused of negligent manslaughter and was Saturday remanded in custody following a Copenhagen court hearing. Madsen's lawyer, Betina Engmark, said he denied the charge. In media interviews, Madsen attributed the sinking to a problem with the ballast tank. Police on Friday had quoted Madsen as saying he had dropped Wall off from his submarine on Refshaleoen island, near Copenhagen, on Thursday night - before the sinking. Wall, 30, a Swedish freelance journalist based in China and the US, was reportedly writing a feature about Madsen. Her disappearance was reported to authorities by her boyfriend early Friday, resulting in a search that culminated in Madsen's rescue and the vessel's sinking. Wall's work, centering mostly on environment, politics and society, includes articles on Haiti's post-earthquake recovery efforts and the Runit Dome. The dome, a provisional concrete cap, spans 111,000 cubic yards (84,000 cubic meters) of US radioactive debris left by Cold War nuclear testing in the Pacific's Marshall Islands. Locals and scientists fear storms could sweep the low-lying waste into the ocean. Madsen made headlines in 2008 when his Nautilus was launched, making it at the time the world's largest homemade submarine. It was able to carry eight people and displace 37 tons of water.